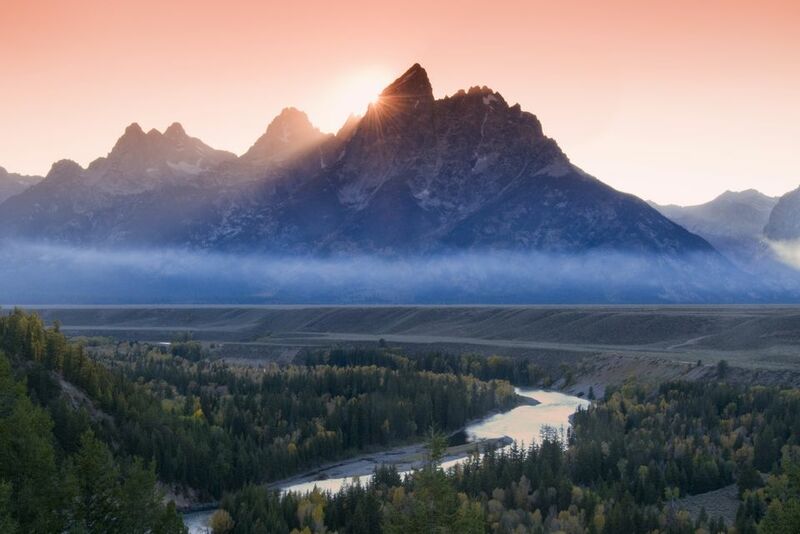 Located in northwestern Wyoming, Grand Teton National Park attracts nearly 4 million visitors each year, and it’s no surprise why. The park is one of the most spectacular parks in the country, offering majestic mountains, pristine lakes, and extraordinary wildlife. It offers a different form of beauty with each season and is open year-round. It is estimated that people entered Jackson Hole 12,000 years ago while archeological evidence indicates that small groups hunted and gathered plants in the valley from 5,000 to 500 years ago. During these times, no one claimed ownership to Jackson Hole, but Blackfeet, Crow, Gros Ventre, Shoshone, and other Native American tribes dud use the land during warmer months. The original Grand Teton National Park, which was set aside by an act of Congress in 1929, included only the Teton Range and six glacial lakes at the base of the mountains. The Jackson Hole National Monument, decreed by Franklin Delano Roosevelt in 1943, combined Teton National Forest, other federal properties including Jackson Lake, and a generous 35,000-acre donation by John D. Rockefeller, Jr.
On September 14, 1950, the original 1929 Park and the 1943 National Monument (including Rockefeller's donation) were united into a "new" Grand Teton National Park - the one we know and love today. Summer, autumn, and winter are the best times to visit the area. Days are sunny, the nights are clear, and the humidity is low. From mid-June and on, you can hike, fish, camp, and watch wildlife. Just be sure to avoid the crowds of July 4 or Labor Day. If you want to see wildflowers, plan for the beginning of May for the lower valleys and plains, and July for the higher elevations. Autumn will showcase gold aspens, lots of wildlife, and less crowds, while winter offers skiing and sparkly snow. For those driving to the park, if you are coming from Salt Lake City, UT, you will need to plan for about 5-6 hours. Here are step by step directions: 1) I-15 to Idaho Falls. 2) Highway 26 to Swan Valley. 3) Highway 31 over Pine Creek Pass to Victor. 4) Highway 22 over Teton Pass, through Wilson to Jackson. You will see a sign in Swan Valley directing you to Jackson via Highway 26 to Alpine Junction, ignore the sign and follow the signs to Victor/Driggs, Idaho. 1) I-80 to Evanston. 2) Highway 89/16 to Woodruff, Randolph, and Sage Creek Junction. 3) Highway 30/89 to Cokeville and then Border. 4) Continue on Highway 89 to Afton, and then to Alpine Junction. 5) Highway 26/89 to Hoback Junction. 6) Highway 26/89/191 to Jackson. For those driving from Denver, CO, you will need about 9-10 hours. Step by step directions: 1) I-25N to Cheyenne. 2) I-80W through Laramie to Rock Springs. 3) Highway 191 North through Pinedale. 4) Highway 191/189 to Hoback Junction. 5) Highway 191 to Jackson. 1) I-25N to Fort Collins. 2) Highway 287 North to Laramie. 3) I-80W to Rawlins. 4) Highway 287 to Muddy Gap Junction. 5) Continue on Highway 287 to Jeffrey City, Lander, Fort Washakie, Crowheart, and Dubois. 6) Highway 287/26 over Togwotee Pass to Moran. 7) Highway 26/89/191 to Jackson. You may also be interested in the shuttle service that runs to and from Jackson and is available from Salt Lake City, UT; Pocatello, ID; and Idaho Falls, ID. Find more info online. If you are flying into the area, the closest airports to the park are: Jackson Hole Airport, Jackson, WY (JAC); Idaho Falls Regional Airport, Idaho Falls, ID (IDA); and Salt Lake City International Airport, Salt Lake City, UT (SLC). According to the website, "the entrance fees are $30 for a private, noncommercial vehicle; $25 for a motorcycle; or $15 for each visitor 16 years and older entering by foot, bicycle, ski, etc. These fees provide the visitor with a 7-day entrance permit for Grand Teton National Park and the John D. Rockefeller, Jr. Memorial Parkway only. Yellowstone National Park collects a separate entrance fee. For visitors traveling to both Grand Teton and Yellowstone national parks, the entrance fee is $50 for a private, non-commercial vehicle; $40 for a motorcycle; and $20 per person for a single hiker or bicyclist. Commercial entrance is based on seating capacity of the vehicle. Seating capacity of 1-6 is $25 PLUS $15 per person; 7-15 is $125; 16-25 is $200 and 26+ is $300. Effective June 1, 2016, Grand Teton will only collect the fee for Gran d Teton. Yellowstone entrance will be collected when entering at Yellowstone. Fees are no longer reciprocal. Reminder - Grand Teton accepts cash and credit cards only. Checks are not accepted." Teton Park Road: This is a great introduction to the park which offers the whole Teton panorama to view. Gros Ventre Range: A beautiful spot to see herds of elk and mule deer grazing the forests, and bighorn sheep on the peaks. Lupine Meadows: For the hikers. Take a strenuous hike that’s worth it in the end. Climb 3,000 feet to Amphitheater Lake for an unbelievable view. Jackson Lake: You should spend at least half a day touring this area. There are many mountain to view and trails to hike. Oxbow Bend: Wildlife is common in this area which also offers a classic view of the Tetons. Death Canyon Trailhead: For the backpackers. Take a 3 day backcountry hike for about 40 miles and enjoy views of Phelps Lake and Paintbrush Canyon. Cascade Canyon: The most popular site begins at Jenny Lake and offers a walk along the lakeshore or a boat ride to Hidden Falls and Inspiration Point. Jenny Lake: 7-day limit opens late May to October; Lizard Creek: ~$12 per night open mid-June to September; Colter Bay offers two campgrounds; and Colter Bay RV park is for RVs only and costs around ~$22 per night. Backpacking is also allowed in the park and does require a permit, which is free and available at Visitor Centers and Jenny Lake Ranger Station. There are 3 lodges within the park, Jackson Lake Lodge, Jenny Lake Lodge, and Signal Mountain Lodge, all offering affordable units ranging from $100-$600. Visitors may also choose to stay at Colter Bay Village and Marina which is open from late May-late September, or Trainagle X Ranch - one of the original dude ranches - which offers 22 cabins. Outside of the park, there are other ranches, like Lost Creek Ranch in Moose, WY, hotels, motels, and inns to choose from. Yellowstone National Park: Mixing geothermal activity with the natural world of the Wild West, Wyoming's Yellowstone National Park exemplifies iconic Americana. Established in 1872, it was our country's first national park and helped establish the importance of protecting the United State's natural wonders and wild places. And it’s just one of many Wyoming national parks that are convenient to Grand Teton. Fossil Butte National Monument: This 50-million-year-old lake bed is one of the richest fossil localities in the world. You will find fossil insects, snails, turtles, birds, bats, and plant remains in the 50-million-year-old rock layers. Today, Fossil Butte is a semi-arid landscape of flat-topped buttes and ridges dominated by sagebrush, other desert shrubs, and grasses. Bridger-Teton National Forest: This 3.4-million-acre forest in western Wyoming is the second largest national forest outside Alaska. It includes more than 1.2 million acres of wilderness as well as the Gros Ventre, Teton, Salt River, Wind River, and Wyoming mountain ranges, from which spring the headwaters of the Green, Snake, and Yellowstone rivers.